PSA Group completed its takeover of the Opel and Vauxhall brands from General Motors on 1 August 2017, installing new managers and helping PSA to become Europe’s second-largest car manufacturer by vehicle sales. Under PSAâ€™s supervision, Opel says it is planning a “much leaner” management structure in order to improve economies of scale and synergies in the fields of purchasing, manufacturing and research and development. The company aims to generate a positive operational free cash flow by 2020 as well as operating margins of two per cent by 2020 and six per cent by 2026. After 88 years under GMâ€™s control, Opel CEO Michael Lohscheller says the company is beginning a new chapter in its history, although it will continue to make technology made in Germany available to everyone. “The combination of our strengths will enable us to turn Opel and Vauxhall into a profitable and self-funded business,” Loscheller said. PSA first said it was in talks to buy Opel in February 2017, before announcing a â‚¬2.2 billion deal in March. The sale of Opel marks a steady retreat from Europe for GM, with the company not being profitable there since 1999. GM CEO Mary Barra has been proactive in quitting markets, including Russia and Indonesia, where GM has lost money, as well as discontinuing Chevrolet in Europe. PSA and Opel will continue to work with GM on electric propulsion development. Opel plants will continue producing vehicles for GM brands Buick and Holden. 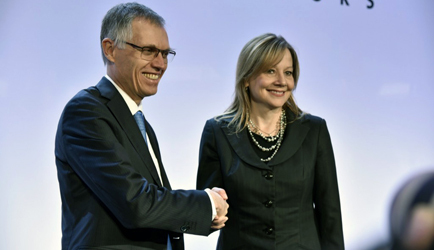 PSAâ€™s Carlos Tavares with GMâ€™s Mary Barra.